I drew this a couple months after we moved to Nashville. It was a random doodle made while messing around with a new brush pen. But it’s also one of the truest statements I’ve ever written. 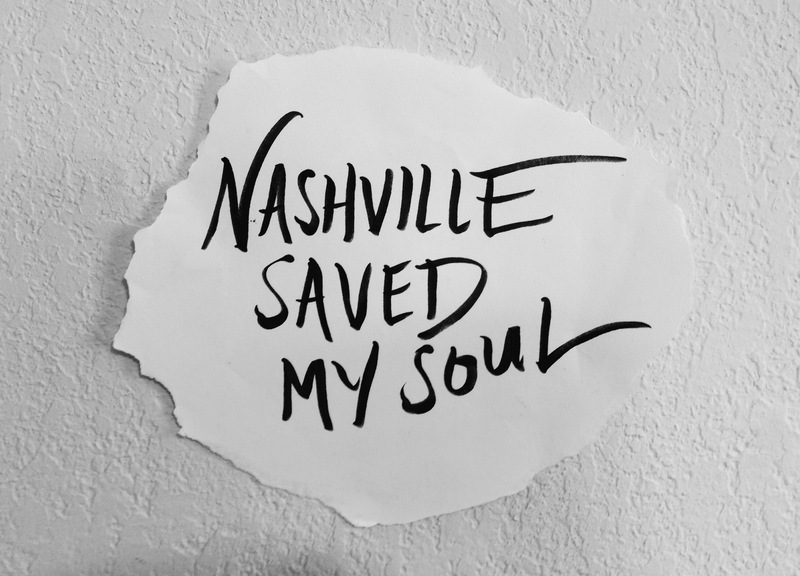 Nashville saved my soul. Nick and I moved here a little over 3 years ago, ready for a change. We weren’t happy in Portland anymore. We weren’t happy in general. We sold everything that couldn’t fit in my Jetta. We said goodbye to all our friends and family. We drove across the country toward a new life. The radio broke in Nebraska and for hours and hours there was only silence and cornfields and a terrified voice inside saying, “My God, I hope we’re doing the right thing.” We watched the sun rise over the mountains in Wyoming. We stayed the night in a room full of ventriloquist dummies in Kansas City. In the middle of one 12-hour stretch of driving, Nick missed the exit for Starbucks and I legit almost broke up with him. And then we came around a bend and saw the Nashville skyline and suddenly we knew that yes, this was not only the right thing to do, but we could do it. Because we did it. Nashville taught me how brave I can be. Nashville taught me about kindness. That’s not to say that first year wasn’t hard. We didn’t know anyone, and even though everyone was super friendly, translating casual friendliness to genuine friendships is tough. Plus, I worked from home. I was so grateful to have Nick by my side but I missed my friends so, so bad. It was, without a doubt, the loneliest year of my life. Nashville taught me how to be lonely. How to feel it. How to not be scared of it. And then, slowly, we made friends. We invited our neighbors to hang out on the porch, and they invited us to their monthly friend group dinners. I got part-time retail jobs in addition to my writing work and bonded with my new coworkers. I met my friend Lauren when she came in to a shop where I was working and mentioned she was reading a book on organic cotton. “I LOVE organic cotton,” I said. “Wanna be friends?” She said yes. There are so many people here that I love so much, and it gives me endless delight to trace the line of our friendships back to those first interactions: a conversation about writing, a yoga class, an anti-NRA protest, a free coffee sample, a smile, and some small talk. These moments led to tea parties and road trips and Harry Potter literary discussion groups and unforgettable nights in smoky karaoke bars and the kind of friends who show up at your front door with flowers and a hug on the night your family dog died, saying “I’m so sorry. I love you.” (Thank you, Christiana.) This city has given me friendships I will treasure for the rest of my life. Nashville taught me how to find my tribe. I’ve told this story many times, but now I want to tell it again: When Nick and I first visited Nashville, about 6 months before we moved here, we got caught in a rainstorm and sought shelter in a cute little coffee shop. We ordered pastries and coffee and at one point I looked around and said to Nick, “I think we’re going to move to Nashville, and I think you’re going to work here.” It was one of the clearest intuitions I’d ever had; a premonition, but also an invitation from the city: come here, and see what happens. So we moved to Nashville, and Nick emailed that coffee shop the day after we arrived, and they hired him. And then the pastry chef at that coffee shop left, and the owner said, “Hey Nick, you want the job?” and Nick, the brilliant baker who had never been able to get a job at a bakery in Portland because he hadn’t gone to culinary school, got the chance he needed. Less than two years later, he had become the executive pastry chef at one of the nicest restaurants in the city. A few months ago, that same voice that told us to move here started saying something different: “It’s time to go try something new.” I didn’t want to listen, because I love this place, these people, our little house with a peach tree in the front yard. But for whatever reason, Nick and I knew, with growing certainty, with grief and gratitude: it’s time to go. Now there’s a “for sale” sign in our yard, the Nashville chapter coming to a close (at least for now), and a new chapter of our lives about to begin. Nashville taught me to trust my intuition, even when it breaks my heart a little. So what’s next? Well, we’re not really sure. We’re going to travel for awhile: starting with a Celine Dion concert in Montreal (naturally), meeting up with friends for a road trip along the coast of France, exploring the British countryside, and working on our Italian in Rome. I’m going to write. Nick is going to bake. We’re not quite sure where we’ll land after that. Maybe we can figure out how to live in Europe in for a bit. Maybe we’ll head back to Tennessee. Maybe Oregon for awhile. Maybe DC. Maybe (hopefully) somewhere near a beach. I don’t know where we’ll end up next, but I know that Nashville will always feel like home. Nashville taught me I had wings. And now it’s time to use them. Previous But Don’t You Miss The Ocean?